Wassail reminds me of Christmas a lot. 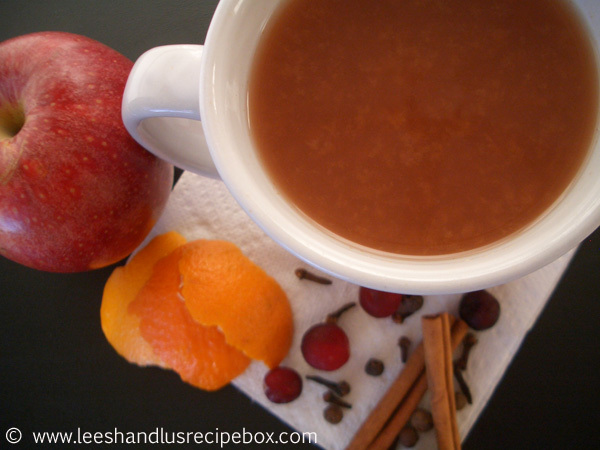 My mom used to make wassail for us as kids around the holidays. The warm drink smells so good and reminds me of home, warmth, family and Christmas time. 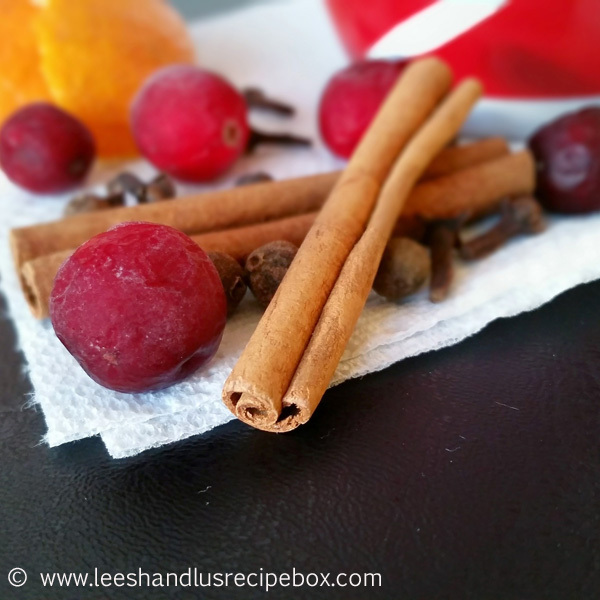 The smell of apple cider, cranberry juice, and spices simmering in a pot (or crock pot) is like pure heaven. No candles or real tree needed to fill the house with amazing aromas. When my husband and I were dating and engaged we started attending the same church (ward) and come to find out, a hysterical man (Mike) that I knew from a mutual friend was one of the counselors in our bishopric. He was good friends with my husband and his brother, Russell. 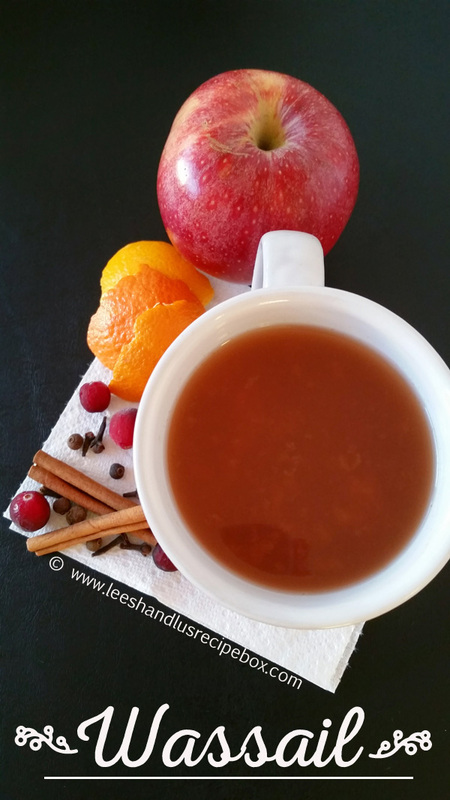 Over the course of conversation that winter we found out he had a marvelous wassail recipe. My husband recalls his brother, Russell making Mike's recipe, and enjoying it thoroughly. So we were after the recipe. Last year I emailed Mike to get his recipe. He sent it to me in the mail along with this intriguing story about where "wassail" comes from. This history makes that wassail even more enjoyable to make! "The word "wassail" presumably comes from an Old English custom known as "wassailing", which was celebrated the night before the winter solstice (Dec 21, in the northern hemisphere). On that darkest night of all the year, the villagers ventured forth into the orchards and fields to toast to the good health of the trees, crops and each other. Of course, to really get into wassailing and wander around in the frigid darkness risking attach by vampires, werewolves or Jack the Ripper, which were known to inhabit the English countryside in those ancient days, it would help to have had several tankards of wassail. Back then the drink was made of liberal doses of ale, cream, eggs, pieces of apple, berries and...who knows what else. One thing is certain: the drink would not have included any citrus juice as many trashy, cheap, modern-day imitation recipes for "wassail" insist upon. Orange and lemon trees have never done well in Britain's fog, rain and cold temperatures. So with that short bit of dubious gastronomical history, let me proceed with the only true wassail recipe that has been personally approved by His Eminence, The Most Reverend and Right Honorable Lord Archbishop of Canterbury." I have to say that this explanation makes this wassail the only legitimate one I could possibly lay my hands on. Aren't you convinced this is the real deal? 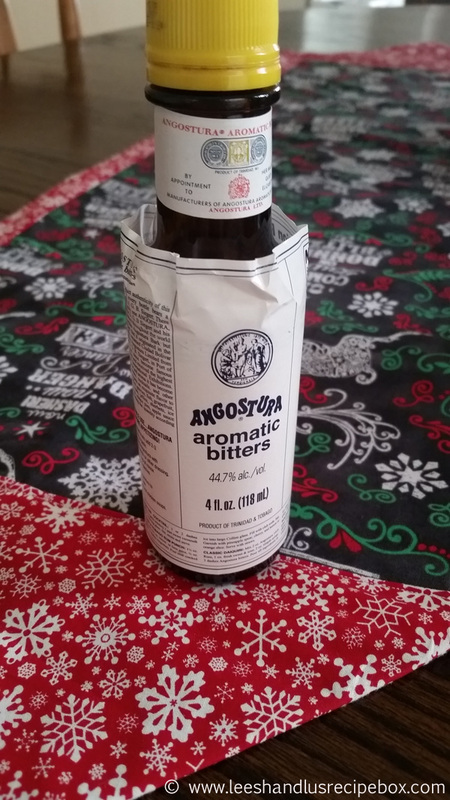 After enjoying several mug fulls of this last winter, I'm convinced this is the only warm holiday drink that needs to be made. It trumps hot cocoa and peppermint tea, no doubt! Thanks for the great history and wonderful recipe, Mike! Also, in case you are like my and don't drink alcohol and might now where to find this mixer. Here is a picture of it. See the recipe notes as to where to find it in the store. 2 quarts apple cider (best variety possible (not apple juice)). - for the apple cider: if you can find a variety from a nearby orchard, that would be best, if not Simply Apple juice brand works well. - Angostura brand aromatic bitters - this is a flavoring like peppermint or vanilla, it can be found in the grocery store near the mixers such as Bloody Mary mix, etc. A small bottle will last a long time and it is really essential to the taste of the wassail. -If you want it alcoholic I’ve been told that 1 cup of Myers Dark Rum goes well mixed in with everything. Combine apple cider, cranberry juice cocktail, sugar, and aromatic bitters in a pot or slow cooker. Place whole spices in a piece of cheesecloth, clean nylon, or teaball with the ends secured up so you don’t have to strain them out when it’s done. Place the peeled (and pith free) oranges in the pot/slow cooker and simmer for at least 2 hours (do not boil). Turn crockpot to high. Once it’s simmered or cooked in a crock pot for 2 hours turn the heat to low to keep it warm and enjoy the drink all day. Store any cooled leftovers in the fridge and reheat to serve again the next day. From a good family friend, Mike Stauffer.